A question that I am often asked: what inspired me to play the drums? My journey began back in 1985. England was enjoying a beautiful summer and as our final year at junior school approached, my friends and I were treated to a school trip to London. The trip included a tour of Wembley Stadium. 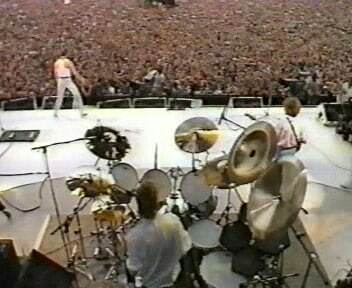 One week later I was sat at our family home and my Dad called me to sit down and “watch this amazing band!” The band was Queen and the event was Live Aid. I was 10. I can remember watching their performance and being spellbound by the raw quality of their music and my eyes were fixated on the drummer, Roger Taylor. His kit looked like some kind of spaceship. Both my Dad and Granddad were drummers and I enjoyed seeing them play as I was growing up. I had no concept that people gathered in their thousands to listen music. I was hooked! I new I had to play the drums from that moment on and I signed up for drum lessons in September of 1985. If your new year’s resolution is to play a musical instrument, don’t delay! Sign up for music lessons today.